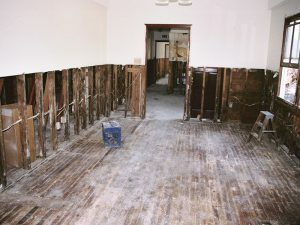 When you experience an emergency such as a catastrophic weather event or pipe burst that causes flooding in your home, do not hesitate to call Flood and Mold NJ for immediate cleanup and removal assistance. There is a severe safety risk associated with flooding that can cause health problems to all members of your family. Our flood cleanup specialists in Ocean County, NJ utilize the proper equipment to identify the source of the damage, and clear any debris before the cleanup and dehumidifying process begins. We’ll come and immediately take a look at your property, working diligently to mitigate the situation and returning a healthy air quality to your Ocean County, NJ property. Whether it’s an internal problem due to a pipe burst or leakage, or an external problem due to a severe storm, levels of damage and impact of safe debris removal can vary. After the flood cleanup and repair, we offer mold removal in Seaside Heights, NJ so you remain healthy and comfortable inside your home. As the cleanup process concludes and all furniture is removed and dried, our team begins to repair damaged areas of your property near Lakewood, NJ. We offer more than simply replacing your floors or walls. The water can be contaminated and bring sewage and toxins into your home. Our repair services include restoring the textile, carpet, and upholstery. The entire area will be deodorized and disinfected by way of our advanced equipment. After our mold remediation in Ocean County, NJ, we examine how much damage your home has sustained. Let our certified team of professionals in Lakewood, NJ repair your property and protect your home environment. At Flood and Mold NJ, we offer emergency response service, so you can get back on the road to peace of mind as soon as possible. You need to take steps right away to minimize further damage and complete mold testing in Ocean County, NJ. Our team of New Jersey flood removal specialists have what it takes to protect your home or workplace from the serious material and health consequences that can occur. We serve clients throughout Ocean and Monmouth Counties. Call our us today to learn more or for your FREE consultation!